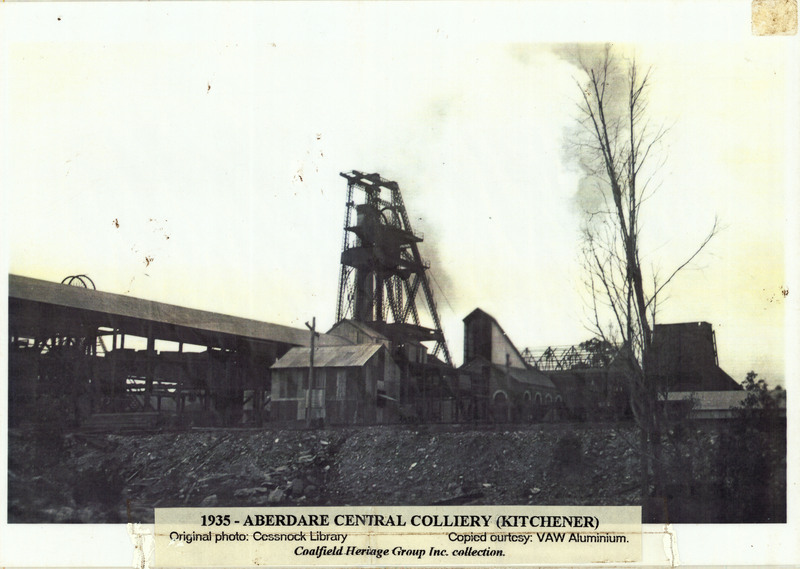 Aberdare Central Colliery (Kitchener) - 1935. Courtesy of the Coalfields Heritage Group, based at the Sir Edgeworth David Memorial Museum at Kurri Kurri. While this incident on the 22 June 1938 is considered a 'tragedy' rather than a 'disaster', it did trigger a renewal of discussion around coal safety. Brothers Peter and James Harrower were buried in a coal fall. After a large rescue attempt involving over 150 people and over ten hours of work, Peter was rescued. Some rescuers were injured in the attempt, however James Harrower was the only fatality. Two weeks after this on July 11, another man died in a coal fall. After the second death miners protested, asking for further safety measures. Unfortunately, a few weeks later on August 2, a safety inspector died of gas inhalation. "ABERDARE CENTRAL DEPUTY'S TRAGIC DEATH." The Cessnock Eagle and South Maitland Recorder (NSW : 1913 - 1954) 26 Aug 1938: 8. Web. 26 Jun 2013 <http://nla.gov.au/nla.news-article99454752>. "GRIM DRAMA IN DEPTHS OF ABERDARE CENTRAL COLLIERY." The Cessnock Eagle and South Maitland Recorder (NSW : 1913 - 1954) 24 Jun 1938: 3. Web. 26 Jun 2013 <http://nla.gov.au/nla.news-article99463823>. "MINER KILLED AT ABERDARE CENTRAL COLLIERY." Singleton Argus (NSW : 1880 - 1954) 22 Jun 1938: 2. Web. 26 Jun 2013 <http://nla.gov.au/nla.news-article81916589>. "MINERS PROTEST MEETING AT CEMETERY GATES." The Cessnock Eagle and South Maitland Recorder (NSW : 1913 - 1954) 24 Jun 1938: 7. Web. 26 Jun 2013 <http://nla.gov.au/nla.news-article99463850>.